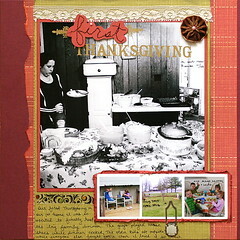 November is right around the corner, and TSS cooked up a perfect kit for scrapping your Fall traditions. Everything from Raking leaves to cooking up a feast for Thanksgiving, the Harmonie kit is just what you'll need. Take a look at the close up of the papers included. 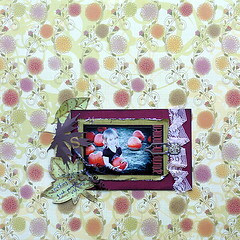 Kit features papers from Harmonie. All papers are single sided. 1-Le grand feuillu, 1-Feuilles et papillons, 1-Nappe d'automne, 1-Feuillage ambre', 1-Toile olivine, 1-Petites fleurs & dentelle, 2-Bazzill Burning Ember, 2-Bazzill Wine, 1-Jenni Bowlin Stuido Rub-On Alpha Vintage(gold), 1/2 pkg making memories Mocha Epoxy Clips, 1/2 pkg Maya Road Velvet Pleats brn/Crm, 8 each Sheer Journaling Card, 1 yd. Maya Road Sheer Scrolls Ribbon, Handful Fall Harvest Adhesive Gems, 1 each Cinnamon stickles, 1 yd. Antique beige ribbon, 1 each Leaf applique. I can't say this enough.. but no matter how you photograph it, these papers just aren't done any justice until thier in your hot little hands. Check out what I've completed so far with this kit. A hot little tip for ya... You can color the cream velvet pleats from Maya Road with Ranger Distress ink and a water brush! And if by chance it's hot in your neck of the woods, and Autumn isn't knocking on your door just yet, check out the other Hot kit WRMK Nonsense. If you buy one, lemme know!! I can't WAIT to see what you do with one or both of them. LOVE what you made with the kit this time round! Beautiful! I LOVE what you did with the harmonie kit. You do awesome work. Thanks for the blog comment. I love, love that I can wear that coat now. I live in the country, but I walk at a campground/rv park/fishing kind of place behind our house. I used to be the same as you and not want ANYONE looking at me. I wouldn't go over there on the weekend. The more I've gotten into it though, the less it has mattered. Now I am just feeling good and wanting to go!! 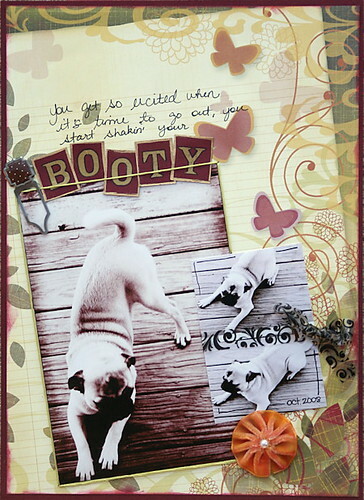 Love your quote of the day and your pug pictures are simply adorable!!! sh!t out of that kit!love the Booty and capturing the moment beautiful! !love how you cut out the tree! 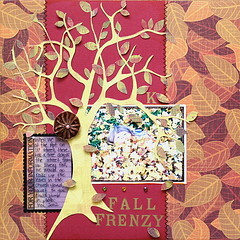 TallyScrapper's Oct. kit. yumm~o people!! Ahh, the joys of motherhood.